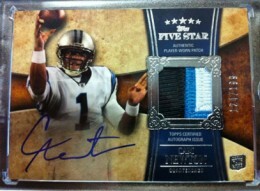 What Are the Most Expensive Cards from 2011 Topps Five Star Football? 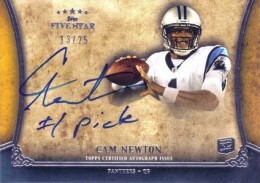 Having been out for almost a couple of weeks now, 2011 Topps Five Star Football cards are, not surprisingly, bringing some extremely strong sales. 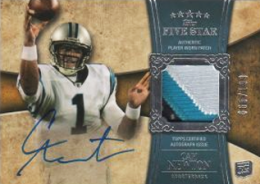 Highlighted by on-card autographs, high-end memorabilia patches and the favorable afterglow from last year's set, 2011 Topps Five Star Football is tearing up the single-card market. 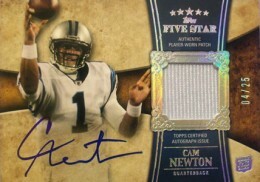 To the shock of no one, Cam Newton dominates the list of cards reaching the highest prices. The rookie quarterback is featured on eight of the top 10 selling cards. 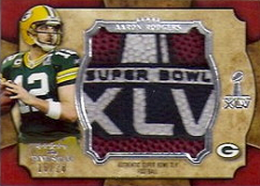 His rookie card, which comes with a jersey patch and on-card autograph, and is numbered to 199 is commanding huge sums. With just a couple of exceptions, the cards have been selling for at least $500. 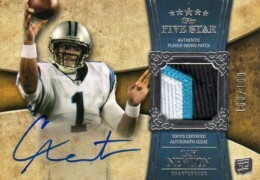 Unless someone supplants Newton as the best player of this year's rookie class, the 2011 Topps Five Star Football Cam Newton will be one of the best rookie cards of the year, if not the best. Other Newton cards to make the list include rookie parallels numbered to 25, a dual laundry tag autograph that also features Jake Locker and an inscription autograph numbered to 25. 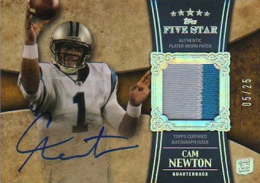 The only two cards that don't have the Panthers' quarterback are a pair of dual autographs. A card with clean signatures from Joe Montana and Jerry Rice closed on eBay at $799. 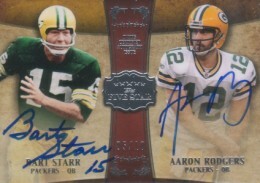 A dual autograph of legendary Green Bay quarterbacks Bart Starr and Aaron Rodgers saw bidding reach $710. Cards not cracking the top 10 but still seeing extremely strong bidding include more of the Super Bowl memorabilia cards, inscribed autographs from Hall of Famers and multi-player autographed patch combos. 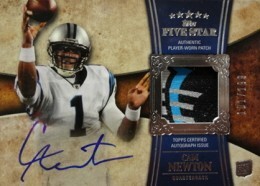 Cam Newton 2011 Topps Five Star 3 Color Patch Autograph Rookie 34 55!